The idea was for an aircraft of low initial cost and low operating cost to enable the many young people of the day to follow up their Private Pilot Licence with a modestly priced 200 hours needed for their Commercial Licence. That was the original concept of the Andrews A.1 and the whole philosophy of its design. The structural design of the A.1 was heavily influenced by the limitations of small production lines and the need to be built in workshops which normally catered for maintenance with the addition of some simple tooling. 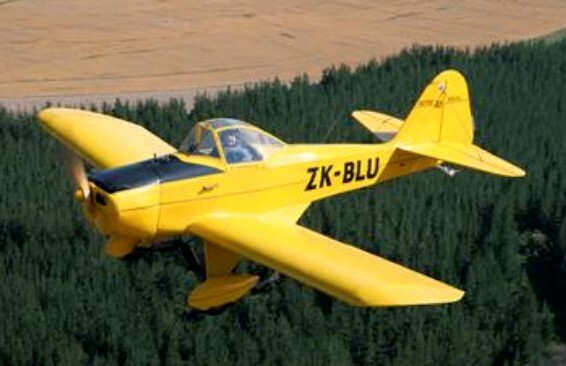 This aircraft, of which there is only one in existence (ZK-BLU), was the pioneer post-war homebuilt in New Zealand. It was built to Certificate of Airworthiness standard during the 1950’s by a CAD aeronautical engineer, Mr Cliff Andrews, although it later flew under a Permit to Fly. It first flew in 1957 but was largely inactive until 1973 when it was restored by Mr Andrews and sold to Alan Rowe of Lower Hutt. The aircraft’s construction employs a welded tube fuselage and tailgroup, and wings constructed of two wooden spars with a Warren-girder metal truss structure between. The whole airframe is fabric-covered. Engine: Continental A65, 65 hp.